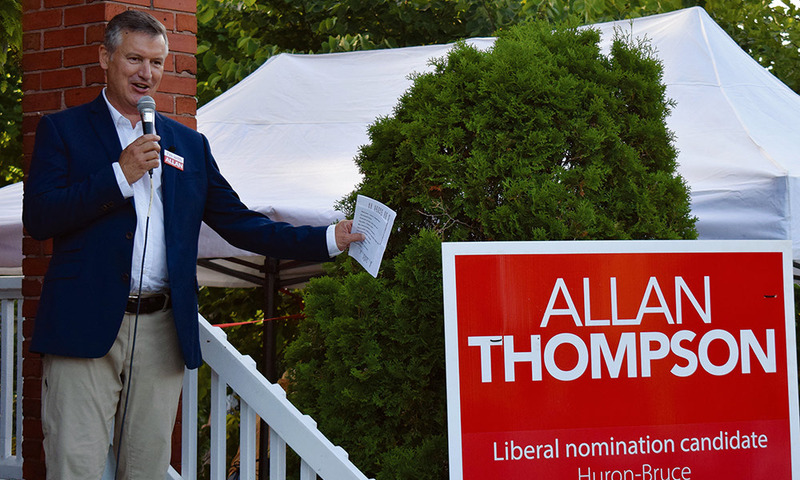 Allan Thompson of Goderich is running again in hopes of winning the Huron-Bruce Liberal nomination ahead of next year’s federal election. Thompson made the announcement on the steps of his family’s new Market Street home in Goderich. The event served both as a stage for the announcement and as a housewarming party for the Thompsons, who just recently became Goderich residents. Introduced by his real estate agent and friend Laura Herman, Thompson spoke to over 150 friends, family members and supporters at his home ahead of a dinner and party that went on into the night. Thompson was chosen as Huron-Bruce’s Liberal candidate in the 2015 election under Justin Trudeau, who would be elected Prime Minister in that election. In Huron-Bruce, he garnered nearly 40 per cent of the vote throughout the riding, but came up just short of incumbent Conservative Ben Lobb, who earned just under 45 per cent of the total riding vote. After officially announcing that he planned to seek the Liberal nomination in 2019, Thompson told his supporters that he felt it would be a tough road ahead. “We will be fighting an election campaign... this will be a hard-fought, tough election – no question. Part of that is because we know we will be facing an opponent who will use the politics of fear and division and identity to try and turn people against each other,” Thompson said. He added, however, that he and the Liberal government aim to rise above and stay positive. “When they go low, we go high,” he said. Thompson said that he felt there was room for improvement in Ottawa when it came to Huron-Bruce representation, adding that rural values need to be applied in the nation’s capital. “I honestly think people across the country, but especially people in Huron-Bruce, deserve a politics that is positive, optimistic, ambitious and that just rises above and that’s the kind of campaign I want to run,” he said. He also said that Huron-Bruce’s representative within the federal government should be prepared to defend rural values and rural residents. “I firmly believe that Huron-Bruce needs and deserves a stronger voice in Ottawa; an MP who is ambitious, proactive and effective and ready to stand up for the people who live in rural communities,” he said. 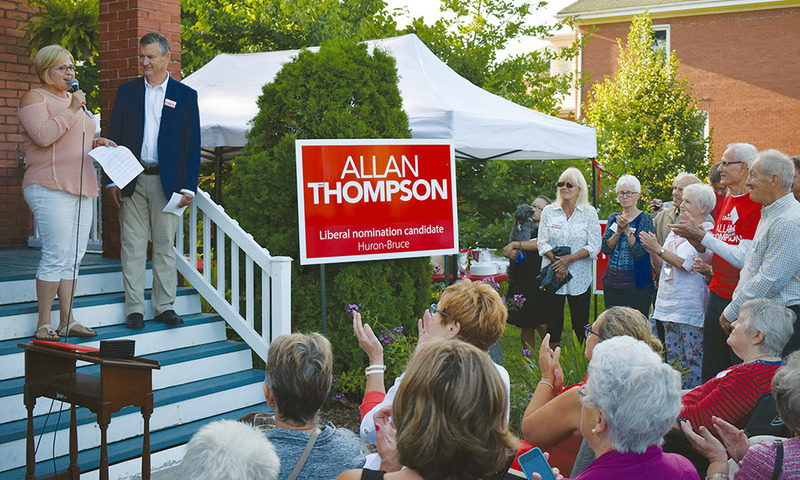 Thompson said that he is confident that Trudeau and the Liberals will form the government once again in 2019 and that the people of Huron-Bruce deserve a representative from that positive government. He added that while Huron-Bruce and other rural ridings across Canada may have a reputation for being Conservative, he said that’s an unfair assumption. Thompson said that when he decided to run again, he looked to his brother Gord for advice, saying he is the “original politician” in the Thompson family as the former mayor of Kincardine. Thompson then thanked his numerous supporters and his family for all of their hard work on his campaign, both at home and on the road. He said he felt as though his father, Ron, who passed away in recent years, would be proud of his son and the Trudeau government, despite being a life-long conservative. Thompson is a former political reporter from the Toronto Star and is currently on sabbatical from Ottawa’s Carleton University where he is a journalism professor. According to his release, he recently launched a communications firm based in Goderich. Thompson was born and raised on a farm outside of Glammis in southern Bruce County. He attended Bruce Township Central Public and Walkerton District Secondary Schools and began his career as a journalist as a reporter with the Kincardine Independent and Teeswater News. Thompson is married to Roula El-Rifai, who works at the International Development Research Centre. Their son Laith is starting his second year at Carleton University. For more information, or to get in touch with Thompson, visit www.allanthompson.ca or follow him on social media.